Formerly known as the Sunnyvale Town Center, project owner, STC Venture LLC chose the name CityLine Sunnyvale in 2017. 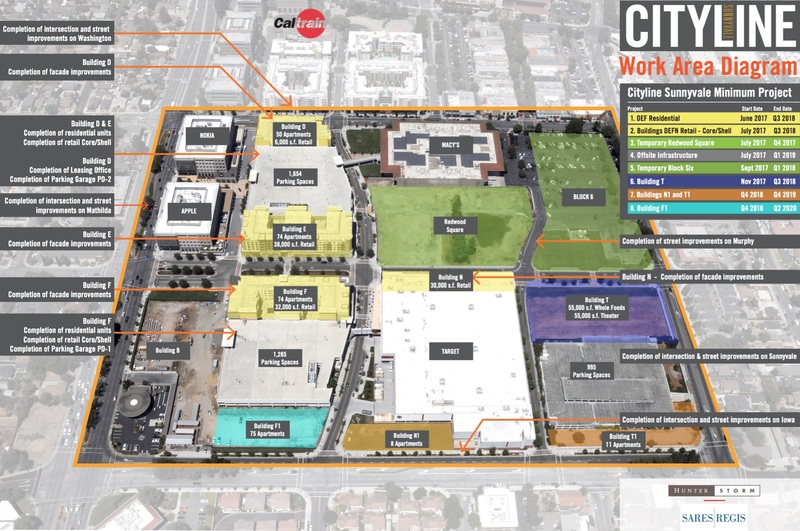 The project is located on a 36-acre site in downtown Sunnyvale and is aimed at igniting the area with retail, entertainment and housing following the 2003 closure of the original Town Center Mall constructed in 1978. The project has experienced several delays over the past decade including during the economic downturn in 2009, however construction activities are now in full swing. The work will occur in three phases, and a key component is the extension of Murphy Avenue, connecting downtown to McKinley Avenue. Just south of the Historic Murphy Avenue District, CityLine Sunnyvale is located within the boundaries of Mathilda, Washington, Sunnyvale and Iowa Avenues. Once complete, the project will cover six blocks and build on the pre-existing retail and offices in the vicinity with a balance of a mix of uses including new residences to support the influx of commercial. The vision is for inviting, tree-lined streets connecting retail, office spaces, restaurants, a movie theater, a hotel, parking garages and 292 housing units. All will surround Redwood Square, a central plaza area. The project is a joint venture by J.P. Morgan Asset Management, Hunter Properties for the commercial aspect and Sares Regis Group of Northern California for the residential portion. The Murphy Avenue extension will provide a segue to a two-story building that’s under construction at the corner of Murphy and McKinley Avenues geared for a Whole Foods Market and AMC Theaters slated to open in 2019. The extension will also provide both the necessary parking and pedestrian routes to attract businesses and patrons to the area. Construction is nearing completion on three residential buildings containing 198 units on the southwest corner of Washington and Taafee Street, the northwest corner of Taafee Street and McKinley Avenue and the southwest corner of Taafee Street and McKinley Avenue. The buildings also contain ground floor retail spaces that should be completed by year’s end. 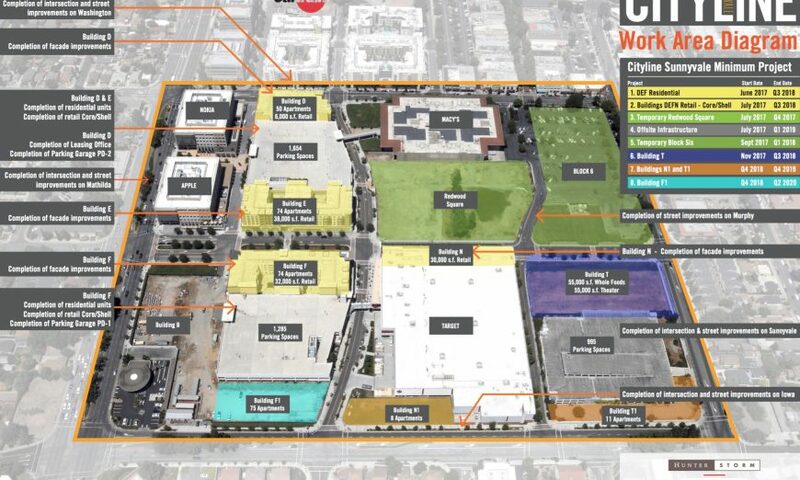 Construction has also begun for the commercial building to house the Whole Foods and AMC Theaters. Infrastructure work on the 36-acre project site has been going steadily this summer. In August, new curbs and gutters were created at Washington and Sunnyvale Avenues. Sidewalks at Sunnyvale and McKinley Avenues were demolished and replaced, and asphalt was poured for new sidewalks at Aries Way and Booker Terrace.